Chase College of Law will remain in Highland Heights. Northern Kentucky University president Geoffrey Mearns announced on Monday that the campus has concluded an evaluation related to a possible move of the law school to downtown Covington, and concluded that it was not financially viable for the university at this time. Kenton County had hoped to lure NKU's Chase Law to Covington as it prepares to vacate the 1969 building on Court Street near the southern foot of the Roebling Suspension Bridge. The county announced earlier this summer that it had bought the old Bavarian Brewery Building near I-75 and 12th Street/Martin Luther King Boulevard where a new government campus will be created. “President Mearns’s comments reflect the ongoing funding issues confronting our region’s postsecondary education institutions. 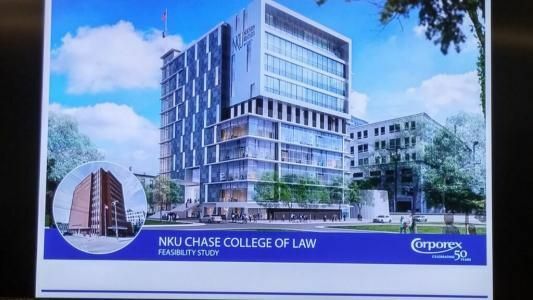 While a pathway to financing the renovation of the county administration building existed, a solution to the ongoing operational funding challenges facing NKU did not," Kenton County Judge/Executive Kris Knochelmann said in a statement. The county, the Catalytic Fund, and Corporex evaluated possibilities for the towering structure that still houses the old detention center's infrastructure on multiple floors, years after the jail moved to a new facility in South Covington. Renderings were created of what the building could look like as a new home for Chase, and an evaluation was also done to explore the possibility of making the building residential. The proposed relocation of Chase from Highland Heights was not entirely popular in Campbell County. The proposal was adamantly opposed by County Commissioner Charlie Coleman and others.